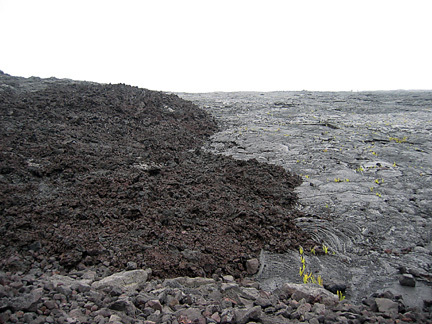 There are two types of lava at Kilauea. Aa, on the left, and pahoehoe, on the right. Chemically the lava is the same, but aa lava is thicker and rougher. Pahoehoe lava tends to flow in thin (a couple of inches) sheets, while aa flows may be a several feet thick.